Preble Shawnee’s Jenna Lovely earned 1st-team All-Southwest District in Division III. PREBLE COUNTY — Preble Shawnee senior guard Jenna Lovely earned Division III first-team All-Southwest District honors. She heads the list of four county players who were honored. Lovely’s teammates, Logan Hollon and Nicole Sims, both seniors, were honorable mention selections. In Division II, Eaton’s Bailey Shepherd was an honorable mention pick. The 2018-19 All-Southwest District girls basketball teams were selected by a media panel from the district. FIRST TEAM: Maddie Antenucci, Cincinnati Indian Hill, 5-foot-10, junior, 19.3 points per game; Emma Broermann, Hamilton Badin, 6-2, sr., 17.0; Elisabeth Bush, Dayton Carroll, 5-8, sr., 13.5; Layne Ferrell, Franklin, 6-1, sr., 20.8; Lauren Hapgood, Dayton Oakwood, 5-8, sr., 20.0; Mikala Morris, Springfield Kenton Ridge, 6-2, sr., 27.0; Kylee Sheppard, Cin. Roger Bacon, 5-9, so., 11.3. PLAYER OF THE YEAR: Layne Ferrell, Franklin. COACH OF THE YEAR: Andy Holderman, Tipp City Tippecanoe. SECOND TEAM: Emily Byrne, Cin. McNicholas, 5-9, sr., 13.0; Clarissa Craig, Roger Bacon, 6-3, so., 13.0; Paige Garr, Goshen, 5-7, sr., 17.2; Sha’mya Leigh, Trotwood-Madison, 5-10, sr., 17.9; Ashleigh Mader, Tippecanoe, 5-8, so., 11.2; Chloe Smith, Germantown Valley View, 5-9, sr., 11.7; Sky Thomas, Cin. Wyoming, 6-2, sr., 8.8. THIRD TEAM: Ti’ Ajisa Christopher, Cin. Woodward, 5-6, jr., 16.9; Kendall Clodfelter, Tippecanoe, 5-6, jr., 8.3; Julia Keller, Carroll, 6-0, jr., 13.3; Haleigh Mayo-Behnken, Greenville, 5-7, jr., 12.2; Ella Riggs, Cin. Indian Hill, 5-7, fr., 17.0; Jordan Rogers, Franklin, 5-9, so., 10.0; Sophie Sloneker, Monroe, 5-11, sr., 10.0. Staci Greene, Jordyn Varise, Dayton Chaminade Julienne; Myeesha Hall, Jordan Pettigrew, Dayton Ponitz Career Technology Center; Quantaijah Huffman, Trotwood-Madison; Katelyn Nash, St. Paris Graham; Shelby Nusbaum, Badin; Olivia Patel, Batavia; Leah Ruffin, Ponitz; Bailey Shepherd, Eaton; Aubrey Stolly, Bellefontaine; Olivia Wells-Daniels, Monroe. FIRST TEAM: Amil Ali-Shakir, Cincinnati Purcell Marian, 5-foot-8, senior, 13.2 points per game; Jessica Chase, Williamsburg, 5-5, sr., 17.0; Morgan Haney, Casstown Miami East, 5-8, sr., 23.3; Jenna Lovely, Camden Preble Shawnee, 5-6, sr., 12.0; Rachel Murray, Waynesville, 5-6, sr., 19.8; Marcella Sizer, Waynesville, 6-0, sr., 13.3; Lindsey Winner, Versailles, 6-2, jr., 9.4. PLAYER OF THE YEAR: Rachel Murray, Waynesville. COACH OF THE YEAR: Tim Gabbard, Waynesville. SECOND TEAM: Simone Christmon, Cin. James Gamble Montessori, 5-9, sr., 20.2; Kristen Dickison, West Milton Milton-Union, 5-6, sr., 20.2; Taylor Gray, Arcanum, 6-0, fr., 9.9; Sha’Dai Hale, Purcell Marian, 5-11, sr., 11.9; Caitlin McEldowney, Versailles, 5-5, jr., 9.8; Dasia Thornton, Cin. Clark Montessori, 6-1, sr., 17.4; Reagan Ware, Springfield Greenon, 5-6, jr., 13.2. THIRD TEAM: Lauren Barhorst, Anna, 6-2, jr., 10.7; Taylor Bee, Bethel Bethel-Tate, 5-9, jr., 10.0; Kendall Dewey, Cin. Mariemont, 5-5, jr., 14.0; Kenna Gray, Tipp City Bethel, 5-7, so., 11.7; Gabby Hollar, West Liberty-Salem, 5-7, sr., 10.7; Torey Macke, Cin. Deer Park, 5-7. Sr., 11.3; Sylvie Sonneman, Jamestown Greeneview, 5-11, jr., 15.2. Kayla O’Daniel, Hailey Unger, Arcanum; Elizabeth Ording, Versailles; Elecia Patton, Blanchester; Savannah Pavoni, Benjamin Logan; Olivia Reittinger, Bethel; Janay Rose, Bailey Weaver, Deer Park; McKinlee Ruppert, New Lebanon Dixie; Carly Scott, Cin. Madeira; Laura Shuppert, Cin. Seven Hills; Grace White, Bethel-Tate; Erica Wilkerson, Reading; Zion Wright, Clark Montessori. FIRST TEAM: Corina Conley, Arcanum Franklin Monroe, 6-foot, junior, 18.0 points per game; Sabrina Delbello, Cincinnati Country Day, 5-7, so., 13.1; Maddie Downing, New Madison Tri-Village, 6-1, jr., 12.4; Meghan Downing, Tri-Village, 6-2, fr., 12.8; Emma Hess, Xenia Legacy Christian Academy, 5-11, so., 16.8; Marissa Meiring, Fort Loramie, 5-8, jr., 11.0; Samantha Whiteman, Covington, 5-7, sr., 24.8. PLAYER OF THE YEAR: Samantha Whiteman, Covington. COACH OF THE YEAR: Mark Combs, Legacy Christian. SECOND TEAM: Kathleen Ahner, Legacy Christian, 5-7, so., 11.0; Maddi Benjamin, Georgetown, 5-7, so., 10.2; Maggie Coe, Cedarville, 5-6, sr., 21.7; Austy Miller, Bradford, 5-5, fr., 15.2; Abbigail Peterson, Springfield Catholic Central, 5-7, so., 15.7; Laurissa Poling, Russia, 6-0, sr., 12.1; Dana Rose, Fort Loramie, 5-11, so., 8.2. THIRD TEAM: Belle Cable, Franklin Monroe, 5-4, jr., 10.6; Jenna Cordonnier, Russia, 5-8, sr., 12.5; Sarah Earhart, Troy Christian, 6-2, jr., 11.0; Grace Forrest, Mechanicsburg, 5-7, so., 13.5; Kenzie Hoelscher, Fort Loramie, 6-0, so., 7.1; Lissa Siler, Tri-Village, 5-7, jr., 13.3; Angie Smith, Yellow Springs, 5-7, fr., 24.5. Miranda Heid, Caila Nagel, Fairfield Cin. Christian; Trinity Henderson, Ansonia; Carmen Heuker, Botkins; Sidnie Hunt, Union City Mississinawa Valley; Kam Jordan, Cin. Country Day; Cati LeVan, Frani LeVan, North Lewisburg Triad; Jessie Monnier, Houston; Madison Moore, Felicity Felicity-Franklin; Mallory Mullen, Catholic Central; Emma Printz, Tri-Village; Torie Utter, Georgetown. 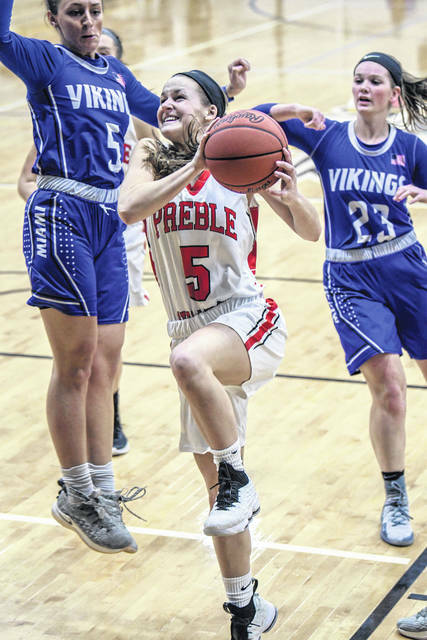 https://www.registerherald.com/wp-content/uploads/sites/41/2019/03/web1_PS-girls-v-ME-1.jpgPreble Shawnee’s Jenna Lovely earned 1st-team All-Southwest District in Division III.